Iraq’s Prime Minister Haider Abadi raised the national flag next to the hospital in the liberated from the Daesh terrorists Fallujah, according to local media. Iraq’s Prime Minister Haider Abadi has raised the country’s flag in the center of Fallujah, which was recently liberated from Islamic States (ISIL or Daesh) militants, local media said Sunday.Earlier on Sunday, Abdul-Wahad Saadi, the Iraqi army commander heading the counter-terrorism operation in the city, said that Iraq’s armed forces had “fully liberated” Fallujah. Abadi, who is also the commander in chief of the armed forces, raised the Iraqi flag next to the city hospital while surrounded by dozens of security personnel, the Al Sumaria television channel reported. The prime minister called on Iraqi people to celebrate the victory and vowed to raise the country’s flag in Mosul, which is still overrun by Daesh militants. Fallujah, located some 42 miles west of the Iraqi capital Baghdad, is one of the largest cities in the Anbar province. The Daesh, outlawed in many countries including Russia, has been in control of the city since 2014.The Iraqi Army and Shiite militias, backed by US airstrikes, launched the offensive to retake Fallujah on May 22. Last week, Iraqi Prime Minister Haider Abadi declared Fallujah liberated from the Daesh, as the government forces gained control of the city center. However, media reported that fighting continued in the city. The United Nations earlier voiced concern over the humanitarian situation in the city, with tens of thousands of residents having fled the fighting. Commander leading Iraqi operation against Daesh in Fallujah declares the city “fully liberated,” according to AP. The operation “is done and the city is fully liberated,” Abdul-Wahad Saadi said. “We announce from this place in central Golan district that it has been cleaned by the counter terrorism service and we convey the good news to the Iraqi people that the battle of Fallujah is over,” Lieutenant General Abdul Wahab al-Saidi told state TV. Military confrontations in Fallujah are ongoing as Iraqi army forces have made great strides against remaining Daesh terrorists in the city and have retaken control of 80 percent of the city.Fallujah, located some 42 miles west of the Iraqi capital Baghdad, is one of the largest cities in the Anbar province. Daesh has been in control of the city since 2014. Iraqi Security Forces have liberated more than half of Fallujah from Daesh terrorist group, Operation Inherent Resolve deputy commander Doug Chalmers said on Thursday. Chalmers said three factors have contributed to the faster pace of the operation: better coordination of Iraqi forces, increased confidence of those involved in the offensive, and experience of the security forces in dealing with Daesh.”They are well over half way through and now very firm in the northern parts of the city,” Chalmers stated in a briefing. “But still it is going to be far quicker than we probably had estimated a couple of weeks ago,” he added. Fallujah, located some 42 miles west of the Iraqi capital Baghdad, is one of the largest cities in the Anbar province. Daesh has been in control of the city since 2014. Iraqi forces have taken control over a railway line in the northern part of the Fallujah city, most part of which was earlier liberated from Daesh, a commander of the Baghdad Operations Command said Monday. On June 17, Iraqi Prime Minister Haidar Abadi announced that the Iraqi security forces had regained control over most part of the city of Fallujah from IS militants, who continued to maintain resistance in the north of the city. “The military have managed to liberate a railway line in the norther part of Fallujah. 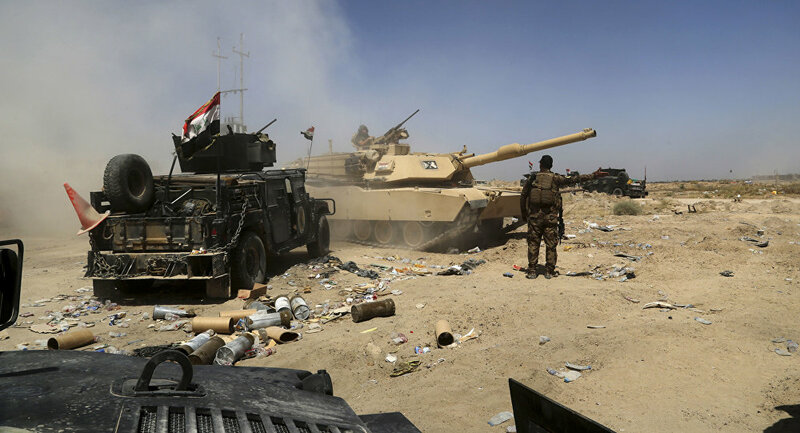 They continue liberating the rest city’s districts from IS militants,” Abdul Amir Shammari, the commander of Baghdad Operations Command, told the Al Sumaria television broadcaster. Fallujah, located some 42 miles west of the Iraqi capital of Baghdad, is one of the largest cities in the Anbar province. The IS, outlawed in many countries including Russia, has been in control of the city since 2014. Hundreds of Daesh extremists attempted to take advantage of the ongoing evacuation of the besieged city of Fallujah by blending in with fleeing civilians.